LucidCam, a 4K 180-degree 3D camera, is launching today with a 15% discount! Here’s why you might want one. It took much longer to deliver to their customers than they originally planned but the final product actually exceeded the original specs. It was originally going to have 1080p per eye video resolution. The actual final product has a resolution of 4K 30fps per eye. More importantly, they did finally finish delivering to all their backers last week. So why get a LucidCam instead of a 360 camera? First of all, heatmaps show that when viewers watch 360 videos, most of them focus only on the front part of the 360 video. 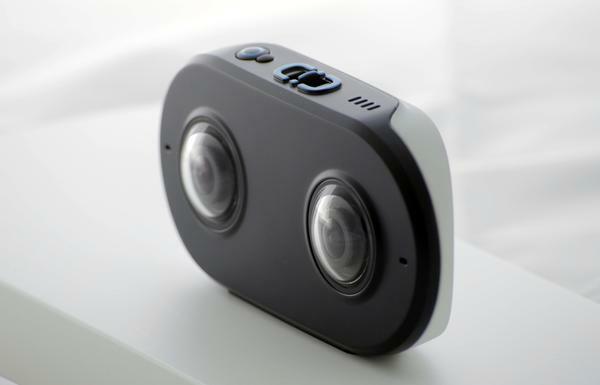 Second, it is easier for consumers to imagine getting a Lucidcam rather than a 360 camera. Picture this: if they had to choose between a GoPro and a 360 camera, then it creates a dilemma for them, and many of them might choose a GoPro as a safer, more familiar option. However, if they are choosing between a GoPro, and a camera that is similar to a GoPro but is wider and is in 3D, then they could see the appeal in getting a LucidCam, just as moviegoers often go for the large popcorn which is just $1 or $2 more than the $5 small popcorn. From a content creator’s perspective, the LucidCam’s front-facing VR experience is also easier to compose for, compared to a fully spherical 360 camera. It’s also helpful that the Lucidcam has in-camera stitching, making it convenient to shoot with. One mystery as Mike Cane pointed out is why Google never mentioned LucidCam in its announcement of the VR180 program. Regardless of whether LucidCam is formally certified as a VR180 camera, it is a de facto VR180 camera, in fact the first such camera to be available to consumers. With LucidCam’s launch, you can get LucidCam at a 15% discount, for a limited time, for $424.15, a $75.85 discount from the regular $499 price. Thank you very much to @Mike Cane (https://atomicsupermen.wordpress.com/) and Jim Jensen (Google+ Photo Sphere Community) for bringing this to my attention! I don’t agree with your statement comparing Lucidcam vs GoPro vs 360 cam. Between a GoPro and a LucidCam, I would choose a GoPro, because I know what I can get (and it’s reliable). A 360 cam is a leap forward, with new possibilities, while I still don’t see what the Lucidcam (or any 180° cam) can offer that a GoPro can’t. I was already excited for this camera but now that it is 4K per eye I’m stoked! Hopefully, Google will clear up how to upload 180 VR videos. Will it require a Google certified camera? Will it require metadata? Will it just be a check box? Also, you can see the camera used in the “Klangstof Interview” video but it might just be a prototype. PS I followed the Blogspot site via RSS. Will the new site also have an RSS feed? Hi Denzel. Thanks for following 360 Rumors on Blogger. I will try to add an RSS feed for 360rumors.com. I don’t know the answers to your questions about VR180, but I will find out. I doubt VR180 content will be a check box as Youtube/Google is moving away from that. The 3D check box is going to be discontinued soon and folks will have to have metadata in their files for 3D content. 360 already uses metadata only. I was a really early backer of the Lucidcam on Indiegogo . . . really early. So, I am very happy to finally have my camera and even more excited with the upgraded resolution and very hopeful we get VR180 compatibility. Wow congrats Brian. My understanding is that there is a switch for equirectangular view. Is that the case? If so, that ought to provide compatibility with YouTube. Today, Lucid posted info on Equirectangular output. Hopefully that is compatible. Fingers crossed. Not sure about the meta-data. When I get a chance, I will give it a whirl. Thanks for posting this Brian! Let me know what you think of it! I love the idea of doubling the resolution by only showing 180 degrees and I’ve been super excited about Google VR180 ever since I saw their sample videos. This sample video however, didn’t even look nearly as good as Googles videos. The resolution looks lower and the stereo/3D doesn’t work as well when you look to the sides. I hope this is because how it was uploaded to YouTube and not due to the hardware in Lucidcam. As soon as there’s a sample video with similar quality to the Google VR180 sample videos, I’m definitely going to buy this camera. Thanks Anders. Yes this camera looks quite interesting, especially now with the upgraded resolution. Speaking of resolution, I know some articles about LucidCam have said that it has a higher resolution than 360 cameras but that’s not actually true. Each lens covers 180 degrees, the same as a two-lens 2D 360 camera, so the resolution per degree of field of view is the same. Nonetheless the samples look pretty good and I hope to be able to review it.